Unilever today called for the consumer goods industry to step-up its efforts to tackle the mounting challenge of ocean plastic waste and create a circular economy for plastics. 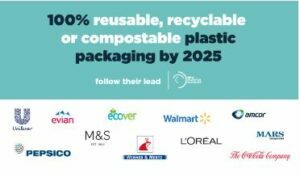 One year after Unilever made its industry-leading commitment to ensure 100% of its plastic packaging was fully reusable, recyclable or compostable by 2025, CEO Paul Polman welcomed news that 10 companies have made similar pledges (Amcor, Ecover, evian, L’Oréal, Mars, M&S, PepsiCo, The Coca-Cola Company, Walmart, and Werner & Mertz). He urged more to step forward to accelerate the industry’s progress towards the circular economy and address plastic leakage into the world’s natural systems including waterways and oceans. Research by the Ellen MacArthur Foundation (EMF) has found that the equivalent of one dumper truck’s worth of plastic enters the oceans every minute, and by 2050 it forecasts there could be more plastic (by weight) in the ocean than fish. Today, only 14% of plastic packaging gets collected for recycling. 1) For companies to invest in innovation towards new delivery models that promote reuse. 2) For more companies to commit to 100% reusable, recyclable or compostable packaging by 2025 and set stretching targets for using post-consumer recycled content. 3) For a Global Plastics Protocol setting common agreed definitions and industry standards on what materials are put into the marketplace, to ensure our packaging is compatible with existing and costeffective recycling infrastructures. 4) For companies to engage positively in policy discussions with governments on the need for improvements to waste management infrastructure, including the implementation of Extended Producer Responsibility schemes. Unilever has made good progress on reducing its waste footprint. Since 2010, the waste associated with the disposal of its products has decreased by 28% and the weight of its packaging has reduced by 15%. The company also stopped sending non-hazardous waste to landfill from its manufacturing sites in 2015. In 2017, the company announced it was making good progress on identifying a technical solution to recycling multi-layered sachets through its Creasolv technology, for which a pilot plant in Indonesia is currently being built to assess its commercial viability. We intend to make this technology open source and would hope to scale it with industry partners, so others – including our competitors – can use it. Hey Buddy!, I found this information for you: "Unilever calls for accelerated industry action on packaging waste". Here is the website link: https://www.duurzaam-ondernemen.nl/unilever-calls-for-accelerated-industry-action-on-packaging-waste/. Thank you.